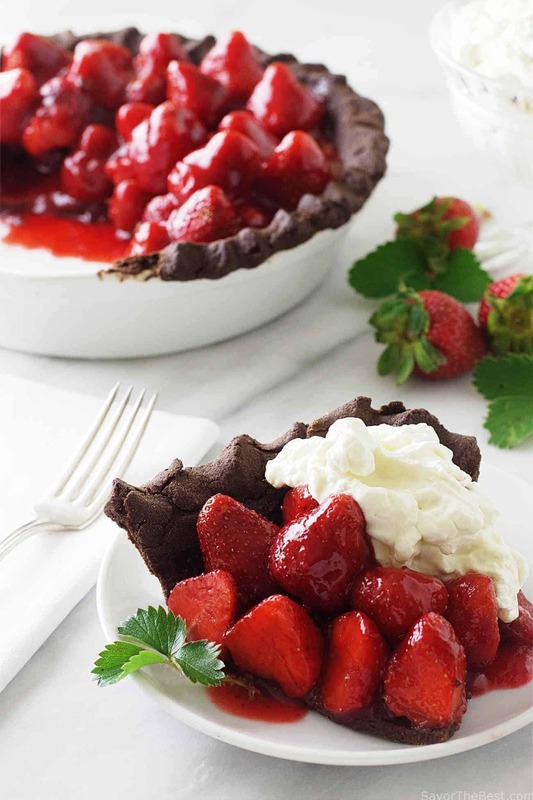 It’s summertime and the living is easy….and this strawberry pie with chocolate teff crust is super easy to make. 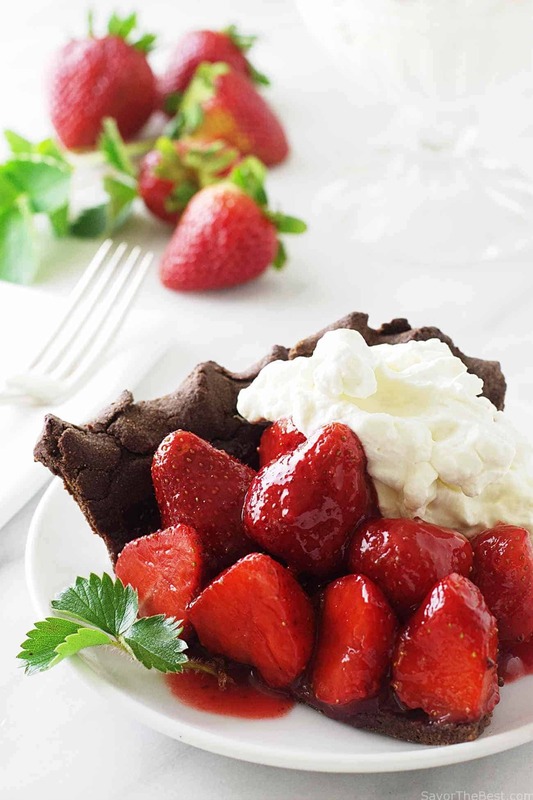 The chocolate teff pie curst has a deep chocolaty flavor that is so complimentary with the fresh strawberry filling. 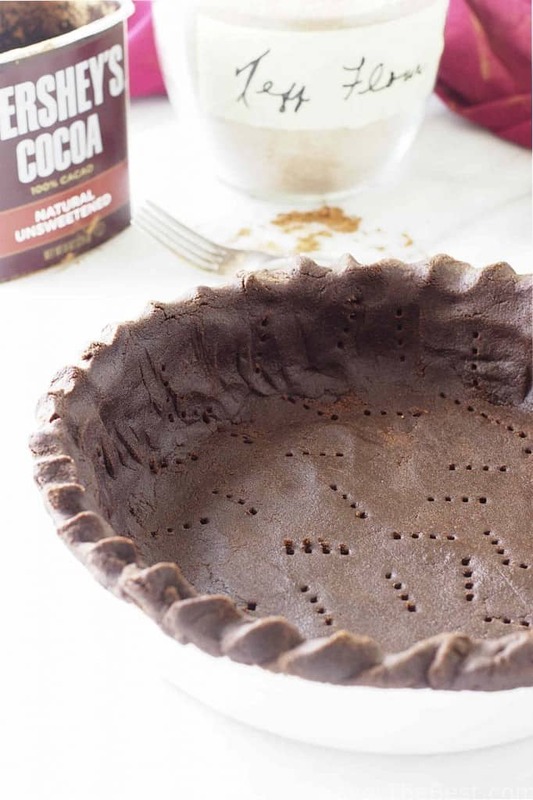 The chocolate pastry crust is made from teff flour which is an ancient grain/seed that hales from Ethiopia where it has been enjoyed for centuries. If you have ever visited an Ethiopian restaurant I am sure you have been served injera, which is the Ethiopian traditional flatbread. Injera is made by combining teff flour and water and letting it ferment for several days. It is then poured into a pan and cooked like a crepe except it is spongy and full of holes appearing almost like a brown lace doily. Teff flour is made by milling the tiny teff seed, which it is claimed to be the smallest seed known to man. It is also so small that it is too difficult to hybridize and is still in it’s God-given natural state. Teff flour is available in both brown and white seeds and can be found in grocery stores, health food stores or online. 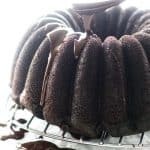 Teff is gluten-free and because it lacks gluten, the chocolate pastry crust in our recipe is not a flakey pastry crust but is more like a chocolate shortbread pastry crust. Delicious, to be sure! This is an easy, press-in, no-roll pastry crust that bakes in just 12 minutes. 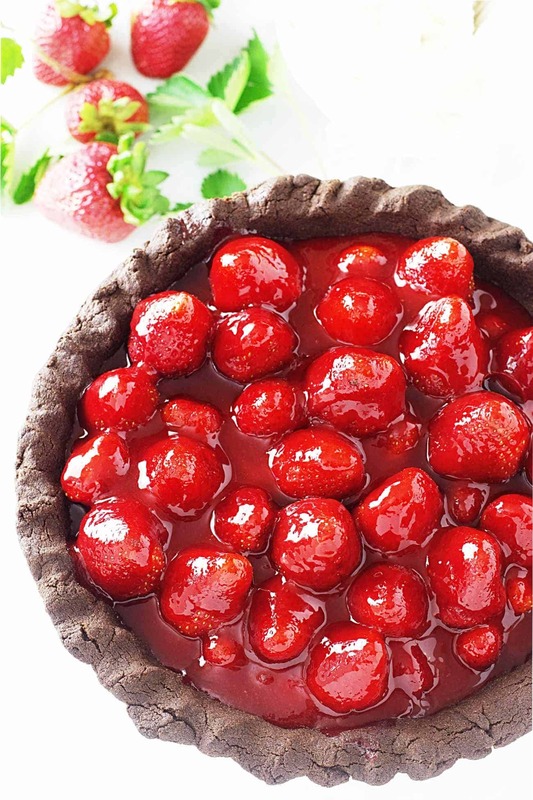 It is filled with fresh strawberries, covered with a strawberry glaze and served with a mound of sweet whipped cream. 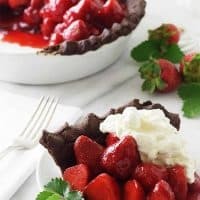 I remember a time when strawberries were only available in the summertime but in these modern days they are available fresh all year long, giving us a chance to enjoy this fantastically delicious fresh strawberry pie with chocolate teff crust anytime we want. Enjoy! Our chocolate teff pie curst for this strawberry pie has a slightly sweet, deep chocolaty flavor that is so complimentary with the fresh strawberry filling. 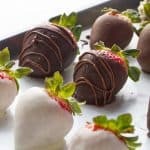 Chocolate and strawberries are always a favorite and this is an easy recipe that is especially delicious. Pre-heat the oven to 375°F - grease or coat with cooking oil spray, a 9-inc pie plate. Put the flour, cocoa powder, egg and oil in the food processor and pulse until thoroughly mixed. Add the water gradually until a soft dough forms. 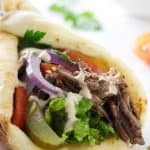 Transfer the dough to the prepared pie plate and using the back of a spoon or your fingers, press the dough to the sides of the pie plate, then press and smooth the remaining dough to the bottom. Prick the dough with a fork on the bottom and sides, add parchment paper or foil to cover the pastry and add pastry weights or beans. Transfer to the oven and blind bake for 10 minutes. Cool on a wire rack before filling. Wash and hull the strawberries, reserve 4 baskets of strawberries until needed. Add 1 basket of the prepared berries to the blender and puree. Transfer the pureed berries to a small pot and add the water. Bring to a boil and simmer for 2 minutes. Sieve berry mixture, discarding the residue. In a sauce pan, combine the sugar and cornstarch and stir in sieved berry mixture. Cook and stir over medium heat until glaze has thickened and is clear. Remove from heat and stir in the food coloring, if using. Spread about 1/4 cup glaze over the bottom and sides of pastry shell. Arrange half of the whole berries, stem end down, in the pastry shell. 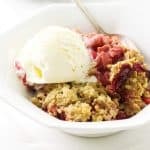 Carefully spoon half of the remaining glaze over berries, covering each berry. Arrange remaining berries, stem end down, atop first layer; spoon on remaining glaze, covering each berry. Transfer to the refrigerator and chill the pie at least 3 to 4 hours until firm. When ready to serve prepare the whipped cream. Place a metal mixing bowl and the metal whisk attachment into the freezer for 10 to 15 minutes. Add the cream and sugar to the mixing bowl and whisk just until the cream reaches stiff peaks. Refrigerate until ready to serve the pie. 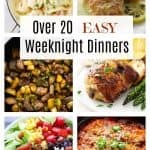 1 question, I’ve seen in similar pie crust recipes that only the egg yolk ok is added. Do you have a view on that or should I have a go and see how i pans out? 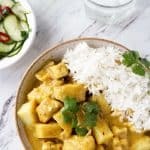 This looks delicious and pretty easy to throw together. Thanks Pat. Just in time for fresh strawberry time! Wow! 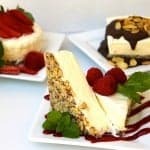 Perfect for a Canada Day dessert up here! Pinned.